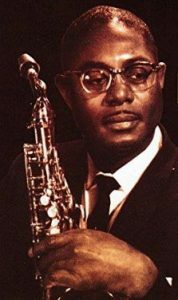 One of the more enigmatic artists in music history, Earl Bostic was among the most skilled saxophonists of all-time, his technical ability on par with anyone, reputedly cutting other legends such as Charlie Parker to pieces on the bandstand, yet he walked away from jazz in order to pursue a more commercial sound in rock ‘n’ roll and in the process his historical reputation took a huge hit, as he was perceived as a sell-out for his actions even as he scored far more hits and greatly expanded the possibilities of rock in the process. Bostic was born in Oklahoma, graduated from Xavier University in Louisiana and after playing professionally in various ensembles made his debut on wax with Lionel Hampton in 1939 and quickly gained a reputation as an inventive musician. By 1944 he was recording under his own name and it seemed as if he would take his place among the jazz luminaries of the day, but by 1947 he was branching out into a more uninhibited style called rock ‘n’ roll and it was his early forays in the field that unleashed the instrument stylistically by focusing on its ability to whip crowds into a frenzy. Unlike most who followed who featured the tenor sax, Bostic played alto but was able to honk effectively with it while at the same time being able to squeal high notes that others couldn’t reach. His first few sides in this field were storming rockers but he got his first hit with “Temptation” featuring a heavier groove. From this point forward he dabbled in everything, doing jazz and pop tunes alongside the more frantic rock output. The jazz community never quite embraced him fully again though even as other musicians still were in awe of his talents, with future star John Coltrane getting his start in Bostic’s band and learning at his feet. Over the years he scored numerous chart hits including a #1 smash in “Flamingo”, but his success in this realm indicated to many that he was merely a commercial act, not a serious jazz musician. Yet Bostic’s work in rock was both influential and artistic, introducing vibes to the sonic palette, adding a more prominent backbeat to his work as he went about redefining old standards with his melodic adventures. In sales he was rivaled only by Big Jay McNeely in rock sax circles but by the late 1950’s Bostic was called upon to churn out so much material for the new album market by his record label, King, that the quality of his output began to suffer, as did his health. He suffered the first of multiple heart attacks in 1957 and his final, fatal, heart attack occurred on stage in 1965.